Photo courtesy Alaska State Troopers. The NTSB is investigating the Era commuter plane that crashed and killed four people and injured six outside St. Mary’s. The government’s full report is many months away, but in the meantime, Era, now known as Ravn and others are digging into the cause of the crash. Witnesses at the airport in St. Mary’s saw the Cessna 208 approaching at a dangerously low altitude and then flying past the runway before it crashed into a tundra ridge. While the cause is still unknown, weather at the time included rain and fog, conditions that make flying challenging. 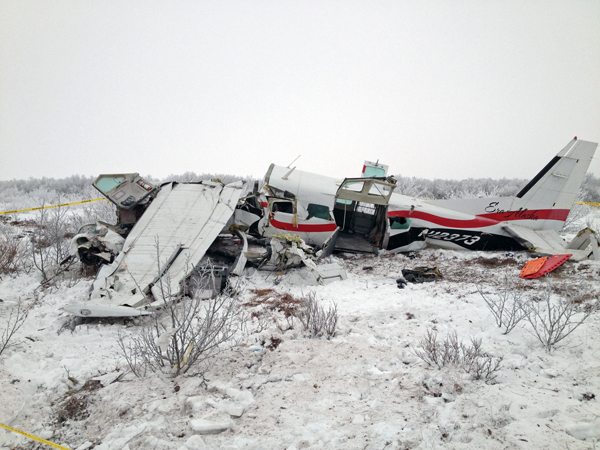 The NTSB is not saying what role the weather played or if the wings took on ice, but Ravn CEO Bob Hajdukovich believes the plane was flying within its envelop of safe operation. The 208 forms a big part of Ravn’s fleet, about a quarter of their aircraft. It’s a workhorse that Hajdukovich believes in. But the aircraft has some history with icing. The NTSB in 2006 released recommendations stating the 208 should not be flown in anything beyond light icing. That’s a recommendation, not a rule. The manufacturer has made some changes. Cessna has swapped the deicing system on new aircraft, from the inflatable boots – that blow up and knock off ice, to an anti icing system, the TKS weeping wing. This puts out small amounts of anti-ice fluid on the wing’s leading edge. This should prevent ice from ever forming. Hageland has not retrofitted any of its caravans. And after the crash, that’s attracted the attention of lawyers, like Ladd Sanger, an attorney with Slack and Davis, a Dallas based firm that works in aviation law. He’s a pilot and has litigated several cases involving the 208. Sanger has been in contact with attorneys working with crash victims. Hajdukovich says that Cessna’s new anti-ice system is not a silver bullet. Ravn has done research into the TKS system. He says it’s expensive and somewhat problematic here. He points to causes some corrosion to the wing, plus you have to have the liquid running constantly, which would require refills at small airfields. Going forward, Ravn is sticking with the caravan. And Hajdukovich says the group is taking a hard look at safety. He says there are some unrelated safety initiatives in play. The company is looking at putting additional controls in place to elevate discussion of weather in the decision to fly or not. And six weeks after the accident, Ravn’s 208s are moving people, groceries, and necessary supplies all over the delta. The caravan flies to nearly 40 communities Ravn serves in the region. No one knows with certainty what happened on Nov. 29. The NTSB says it could be a year before their final report is ready.